I'm back from PyCon so it's time for more pie! I was going to make rabbit pie in honor of Easter, but I couldn't source any rabbit, so I made this pie up. I went with the shortcrust case and puff top because I like that combination. Zero points for presentation but it was sooo tasty. Make the shortcrust pastry by placing the flour in a blender, adding the cubed butter and pulsing for 30 seconds; the result should be something like breadcrumbs. If there's large chunks of butter then keep going for a bit. Then set the blender on low speed and add the water one tablespoon at a time. After three or four spoons the dough should start clumping. Continue blending until it clumps into a ball. Remove the dough ball and wrap in plastic to refrigerate for a couple of hours. Fry the onion in a saucepan that has a good sealing lid until soft. Add the garlic and fry for a minute. Add the beef and cook until browned. Add the sauce, stock cube and enough water to just cover everything. Simmer for 1 hour. Add water if necessary. Pre-heat oven to 180ºC. 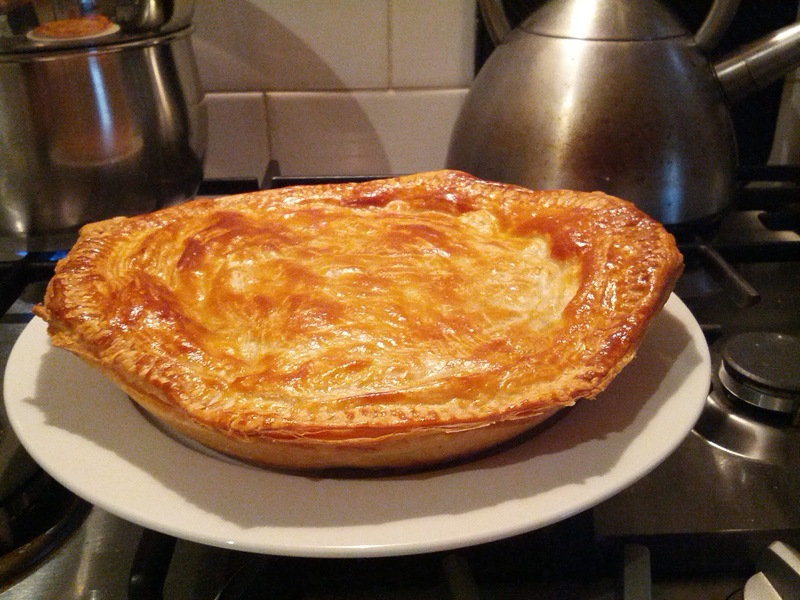 Roll out the shortcrust pastry until big enough to cover the pie dish. Place in dish, prick base many times with a fork, cover with paper and pastry weights and blind bake for 15 minutes. Defrost the puff pastry. Remove weights and paper and bake a further 15 minutes. Slowly add some flour to the filling while stirring thoroughly to thicken. Increase oven to 200ºC. Paint the pie case with egg white and add filling. Cover with puff pastry, ensuring you cover all the existing pastry so it doesn't burn. Crimp around edges with a fork and paint the top with the egg yolk. Bake for 20 minutes until golden brown and puffy on top. 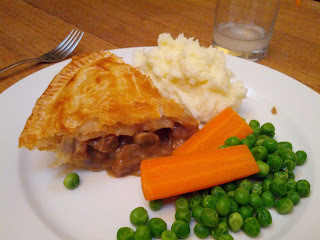 I served this with mash, carrots and peas. It was pretty damned delicious. 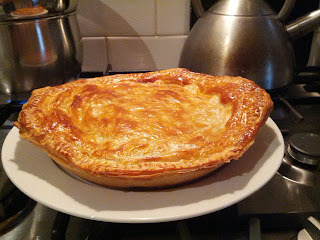 Next time I might try a shortcrust top instead - I think it'd be quite nice.